In Document Editor, you can set the line height for the text lines within the paragraph as well as the margins between the current and the preceding or the subsequent paragraph. Line Spacing - set the line height for the text lines within the paragraph. 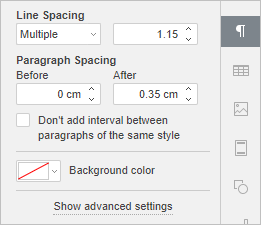 You can select among three options: at least (sets the minimum line spacing that is needed to fit the largest font or graphic on the line), multiple (sets line spacing that can be expressed in numbers greater than 1), exactly (sets fixed line spacing). You can specify the necessary value in the field on the right. Paragraph Spacing - set the amount of space between paragraphs. Before - set the amount of space before the paragraph. After - set the amount of space after the paragraph. Don't add interval between paragraphs of the same style - check this box in case you don't need any space between paragraphs of the same style. To quickly change the current paragraph line spacing, you can also use the Paragraph line spacing icon at the Home tab of the top toolbar selecting the needed value from the list: 1.0, 1.15, 1.5, 2.0, 2.5, or 3.0 lines.